Veterinarians collect samples from Barataria Bay dolphins, Louisiana: NOAA. The bottlenose dolphins of Barataria Bay, Louisiana, are showing signs of severe ill health, according to a report from NOAA. I wrote about the fate of these resident dolphins at the height of the BP’s oil disaster in my Mother Jones’ piece The BP Cover Up. 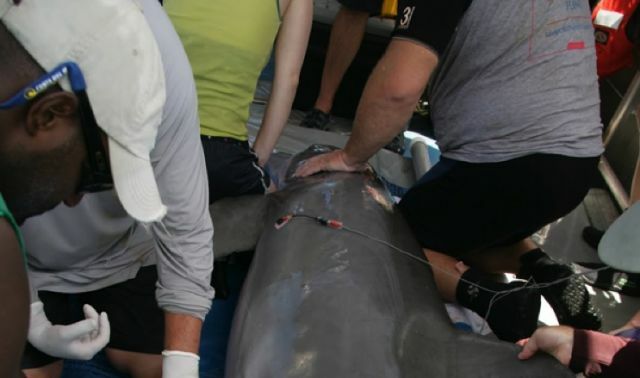 Based on comprehensive physicals of 32 live dolphins from Barataria Bay in the summer of 2011, preliminary results show that many of the dolphins in the study are underweight, anemic, have low blood sugar and/or some symptoms of liver and lung disease. Nearly half also have abnormally low levels of the hormones that help with stress response, metabolism and immune function. Researchers fear that some of the study dolphins are in such poor health that they will not survive. One of these dolphins, which was last observed and studied in late 2011, was found dead in January 2012. 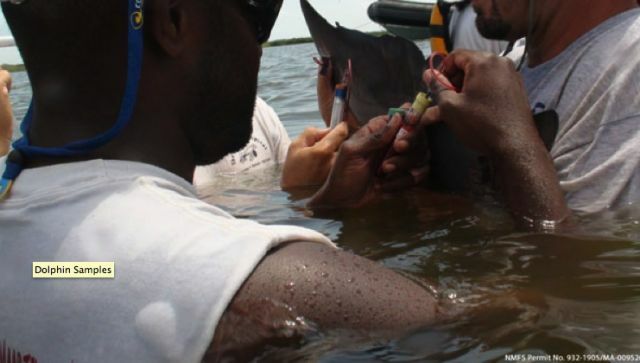 Veterinarians collect a urine sample from Y12, a 16-year-old adult male bottlenose dolphin caught near Grand Isle, LA. Y12’s health evaluation determined that he was significantly underweight, anemic, and had indications of liver and lung disease: NOAA. Since February 2010, more than 675 dolphins have stranded in the northern Gulf of Mexico—a much higher rate than the usual average of 74 dolphins a year. This has prompted NOAA to declare an Unusual Mortality Event and investigate the cause of death for as many of the dolphins as possible. Some waters in the northern Barataria Basin, a larger area that includes Barataria Bay, remain closed to commercial fishing, as visible oil is still present along the shoreline where the closures are in place. The joint protocol directs seafood safety testing to begin only after visible oil is gone.